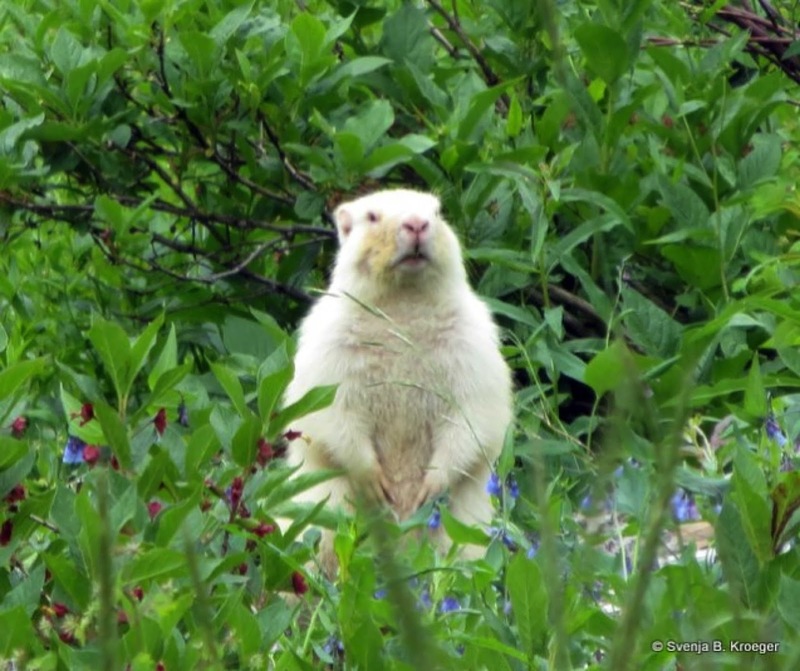 Marmot minutes: Encounter with the albino marmot! Encounter with the albino marmot! Hello everybody, I have exciting news! I was off last week and had the most fantastic marmot-related experience yet! My partner was visiting from Scotland and we were driving up valley to go hiking. We stopped along the way to have lunch and at some point he beckoned me to walk over quietly to where he was standing, whilst excitedly pointing down the hill. I thought he had seen a mule deer, a chipmunk or some other form of wildlife that I had come across many times before during my time here in Gothic, I certainly never expected him to point at an albino marmot, sitting on its back legs, staring at us. I quickly grabbed my camera to capture the moment, and I’m sure most people would agree that this curious animal amidst the wildflowers of Colorado offers a beautiful sight (see picture below). The marmot was spotted and photographed last year as well, however it remains a rare sighting, and of course albino marmots are a rare occurrence in nature in general. I am thrilled that this year, I was lucky enough to see this wondrous creature (we called him Alberto, though I’m not sure whether or not it is a male animal), especially because this is my last field season in the Rockies. Marmot-y greetings to you all!